PanARMENIAN.Net - A new edition of the famous book comes out every year to include and reveal more and more fascinating victories to the world. And now, PanARMENIAN.Net has compiled a list of several of those records - interesting and intriguing - registered in Armenia. Benik Israelyan from Armenia authored the heaviest deadlift with one finger in February 2012, when he raised 121.7 kg with his right middle finger in Yerevan. Leaving aside the question of why anyone would ever try to do that, it’s quite impressive. The longest violin marathon by an individual lasted for a little over 33 hours and was achieved by prominent violinist Nikolay Madoyan on 11-12 February 2017 in Yerevan. Madoyan, by the way, may be included in the Book two more times after playing 6 concertos of Nikolo Paganini for 3 hours and 25 minutes and perform Rimsky-Korsakov's "Bumblebee Flight" on an acoustic violin in 46-47 seconds. The tallest rideable unicycle is 6 m tall and was achieved by Mushegh Khachatryanas measured and demonstrated in Yerevan. After breaking the record for riding a 3 m tall unicycle, the Armenian rode the 6-meter one over a distance of 8.5 m to prove it was 'rideable' and break his own record. Khachatryan has also managed to hop an ordinary unicycle up 62 steps in thirty seconds. Armenia is home to the longest non-stop double track cable car which has a length of 5,752m and is nestled in Tatev, Syunik province. The aerial tramway connects the village of Halidzor with the secluded medieval Tatev Monastery, offering a spectacular journey across the Vorotan River Gorge. Two cabins (each with a capacity to carry 25 people) can operate simultaneously, travelling in opposite directions. Unimaginable as it may sound, the heaviest weight sustained on the body whilst in the crab position was achieved in Yerevan, when a man weighing 113.15 kg stepped on the abdomen of Artavazd Hakobyan. The latter, by the way, balanced the weight for 16,23 seconds instead of the required five seconds. 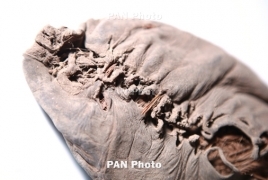 Much has been said and written about the oldest leather shoe, unearthed in a cave in Armenia in 2008, but the finding is a rear discovery, worth the time to speak about. The 24.5cm long footwear dates back 5,500 years and was made of a single piece of hide leather and shaped to fit the wearer's foot. The shoe was well preserved thanks to the thick layer of sheep dung in which it was covered and the stable, cool and dry conditions in the cave.